You’ve been trying to instill a strong sense of freedom and justice into your young one. You’ve taught them all about the light and the dark. You’ve showed them every Star Wars movie in the correct order (original trilogy first) and you’ve even taught them all about the difference between and X-Wing and Y-Wing, so it’s no wonder that they’d be itching to join the Resistance in the fight against the First Order. Kylo Ren and the new legion of Stormtroopers are looking to overthrow the newly established Republic and that’s really not cool. The good news is that now your child can finally do something about it with this licensed Star Wars costume from The Force Awakens. 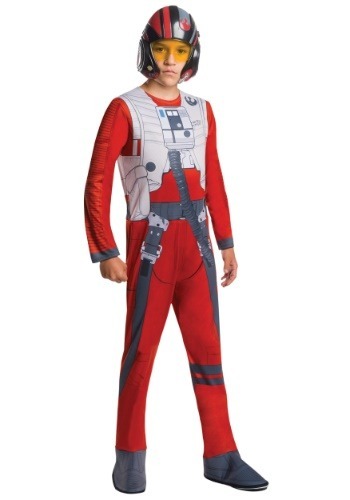 The child Poe costume lets your child look like the greatest pilot in the Resistance! The costume comes with an orange jumpsuit, just like the classic X-Wing pilots’ flight suit and a matching mask. The suit is made of 100% polyester and has printed details on the front and back. The mask is made of plastic and fits with elastic bands in back. The pieces combine for a look that comes straight from the Star Wars film. Of course, this costume won’t give your child nerves of steel, or some stellar piloting skills, so you’d better begin training him if you want him to be able to take on the bad guys. Make sure to check out our entire selection of costumes from the The Force Awakens to create a nice family group costume that will look great this year!